Newgate has the largest specialist property team in London. We have an innate understanding of the real estate spectrum underpinned by senior leadership with in-depth industry knowledge and established media relationships. We provide specialist communications advice to clients across the property spectrum from supporting fundraisings, helping secure planning permission, building corporate reputation, issues management, placemaking through to promoting apartments, office space and retail outlets. From REITS, public affairs and placemaking to commercial, developer and prime residential, our experience spans international and regional markets creating hard hitting campaigns through global channels. Insight informs everything we do with stakeholder and audience behaviour at the heart of our approach, committing to drive commercial difference. We position property-focused funds as expert investors and highlight their successes to ensure a strong appetite from the investment community. We build communication around deals to ensure appropriate recognition for achievements and to encourage a strong deal pipeline for our clients. The teams’ experience spans companies including Berkeley, Lendlease, British Land, Capco., Countryside, Galliard, Wetheralls, Six Senses, Rosewood, Cain International, Bougues – in markets including LA, New York, Hong Kong, Caribbean and UAE. 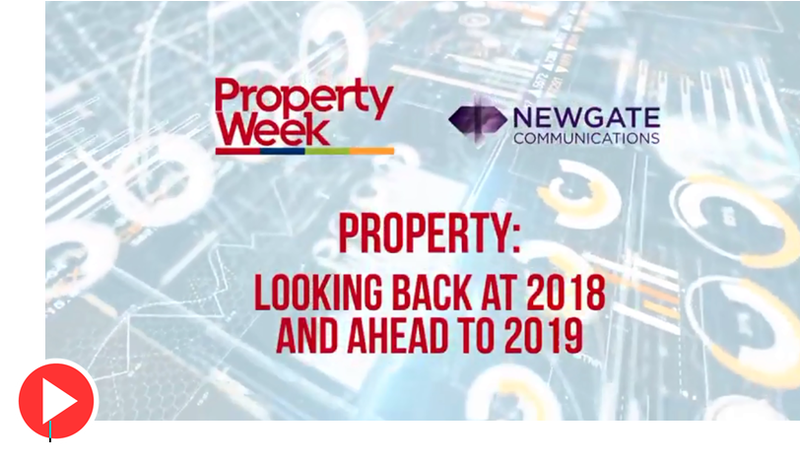 Some of Newgate's property clients look back at 2018 and give their hopes, predictions and resolutions for 2019 in this short film, produced by us for trade magazine Property Week and featured on its website. > Perry is our expert on community engagement, public consultation and securing planning consent. > Henry works with developers, investment firms and consultants to help them achieve clear commercial objectives. > Laura has 20 years of agency experience, across property, luxury hospitality and tourism.